Extraverted Thinking is the main function of the ESTJ. This is the lens that the ESTJ primarily sees the world. Extraverted Thinking wants to bring logical order to the world and external environment. Extraverted Thinking sees little use for the abstract and things that are not definable or measurable. If necessary, Extraverted Thinking will find a way to concretely measure something. Extraverted Thinking is very good at organizing people, processes, and plans into an executable format. The ESTJ will tend to “organize out loud” to people around them. The ESTJ is very good at taking things step-by-step and focusing on the current task at hand. 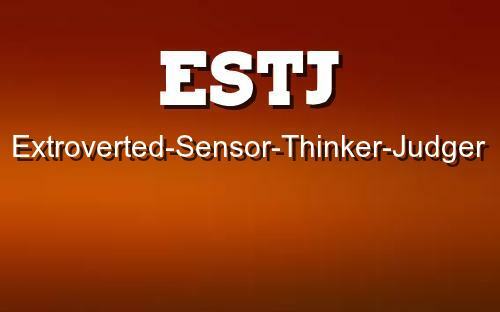 The second function of the ESTJ is Introverted Sensing. Introverted Sensing measures current situations against how they have played out in the past. Introverted Sensing keeps tabs of past information. It uses this past information to “know” whether something is right or wrong. ESTJs are very good at understanding how things work and the important details involved. They can use this to their advantage as they become more and more experienced. ESTJs have been known to work very well in a hierarchical workplace or environmental. They are the type that will “pay their dues” in order to reach more Senior positions. “That’s just how things work” is a phrase than was most likely coined by an ESTJ. This way of thinking can be frustrating to more abstract thinkers and perceiving types. Extraverted Intuition is the third function of the ESTJ. Extraverted Intuition deals with possibilities and “what could be.” Extraverted Intuition sees potential and ways to adapt and change things. An ESTJ with more developed Extraverted Intuition may become less stubborn and be better at seeing others points of view. This can lead to better decisions for everyone involved in a group or project. The ESTJ may also become better at improvising later in life. If the traditional method they have used is not working, they may alter or adapt their plans in order to effectively achieve their result. Introverted Feeling is the fourth and “inferior” function of the ESTJ. The ESTJ has a strong inner world of emotions that they rarely express to others. And many times, the ESTJs emotions will catch them off guard as well. Introverted Feeling deals with an internal set of emotions and morals that will “guide them” through problems. The ESTJ could have an internal drive or vision that is a theme of their actions, and drives them to achieve more. ESTJs can go through a sentimental streak and become overwhelmed with emotions, especially if something is very important to them (i.e. job performance, losing a close friend, falling in love). This can catch onlookers off guard as they are typically a bit more closed off and stoic emotionally. The ESTJ also typically like to remain calm and in control of their emotions, so a strong outburst can be embarrassing for them. However, emotions are a part of human nature, and their expression is typically greeted with more understanding than they might expect.